Two very unlikely heroes led the Penguins into the second round of the 2013 Stanley Cup playoffs. Defensemen Brooks Orpik and Paul Martin scored the game-winning and game-tying goals, respectively, to give Pittsburgh a 4-3 overtime victory over the New York Islanders in Game 6 of the Eastern Conference Quarterfinals and give the Penguins a 4-2 series win. “Before the game, it’s not uncommon to try and pick guys who might score in the game,” head coach Dan Bylsma said. “I don’t think anyone had Paul Martin and Brooks Orpik. Orpik’s series-clinching goal was his first career playoff goal in his 78th postseason appearance (and his first in 107 straight games, regular season and playoffs). “I’d much rather get one now than in the regular season,” he smiled after the game. It came 7:49 minutes into the overtime period and began when Evgeni Malkin had the puck behind the Islanders net. He passed it to Tyler Kennedy on the wall,who dropped it back to Orpik at the point. Orpik lined it up and sent a bullet past Islanders goalie Evgeni Nabokov, giving the Penguins the win in a game they got outplayed until about halfway through the third period. 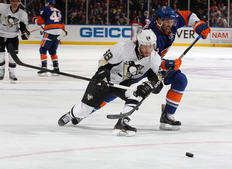 Malkin also assisted on Martin’s goal, which tied the score at 3-3 with just 5:17 minutes left in the third period. Malkin skated the puck into the Islanders zone with four blue jerseys surrounding him, circled the net and hit Martin with a pass at the blue line. He wound up and blasted it into the twine. And while Orpik and Martin scored clutch goals, that’s not where their importance lie. During even strength, they matched up against New York’s star players and brought needed steadiness and calmness to Pittsburgh’s blue line against a fast, energetic, desperate Islanders team trying to stave off elimination in their first playoff appearance since 2007. In addition, the Islanders had three key power plays at key moments in this game. They didn’t convert any of them, thanks in large part to the work of Orpik and Martin. The two defensemen logged the most shorthanded work on the team, with Orpik skating 3:28 minutes and Martin 3:16. It felt like Martin never left the ice in this game, especially after the Islanders took that 3-2 lead just 2:21 into the third period. He ended up topping 30 minutes, because he’s just that kind of player who just does everything well. Martin, who finished with five blocked shots, is a reliable defensive presence you want on the ice in that kind of situation, but he also has the mobility, vision and smarts to contribute on offense like he did tonight. As for Orpik, he excels in a physical, punishing, stay-at-home role (he finished tied with Craig Adams for the team lead with five hits). But man, was it awesome to see the guys mob their alternate captain and team leader after he scored that big goal and dish out more than just free candy. For a team to advance deep into the playoffs, they need to have different players step up at different times. In Pittsburgh’s Game 5 win on Thursday, it was Kennedy and Joe Vitale – who had sat out the first four games of the series – who entered the lineup and provided a spark. Tonight, it was Orpik and Martin. "That's the playoffs," captain Sidney Crosby said. "When you think about it, you have different guys stepping up that don't necessarily always kind of get that opportunity." “In playoffs, you never know who it’s going to be,” agreed Penguins goalie Tomas Vokoun, who made 35 saves at the other end for the win. “It doesn’t matter who scores. We needed the win and we’re glad we don’t have to play them tomorrow. Give them a lot of credit. They played a great series and they played really hard. They’re an up-and-coming good team. They gave us everything we could handle.